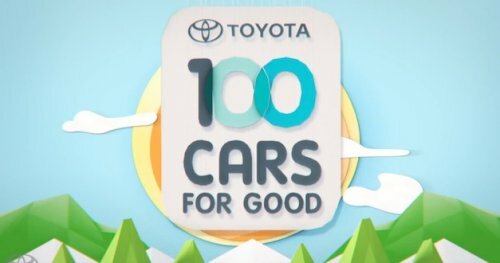 Toyota is revisiting its very popular 100 Cars for Good program that gives away 100 cars in 100 days to charities around the nation. Voting live on Facebook. Last year, Toyota gave 100 cars to 100 deserving charities in 100 days in its 100 Cars for Good program. The unique philanthropic event has the voting public nominating and voting for the winners, with each day presenting a new winner. The vehicle won matches the charity's need, so everything from Sienna minivans to Prius hybrids were in the offing. Today marks the beginning of Toyota's event for 2012, in which 100 cars will be given away over the next 100 days to deserving charities, chosen by the public visiting Toyota's Facebook app for the program. "At Toyota, we appreciate what a big difference a new car or truck can make for organizations that are doing so much to improve lives and strengthen communities across America," said Jim Lentz, President and Chief Operating Officer of Toyota Motor Sales in a press release. "Over the past 20 years, Toyota has contributed more than half a billion dollars to nonprofits throughout the U.S. 100 Cars for Good allows us to build on that commitment in new ways, putting the public in the 'driver's seat' as we work to help community organizations broaden their impact in neighborhoods nationwide." Any registered 501(3)(c) non-profit organization can apply at the 00carsforgood.com website (a Facebook page/site). Applications are open for two weeks (until March 26th) or until 5,000 qualified applications are received, whichever comes first. 500 finalists are then selected from that group, certified by a panel of experts, and then notified by April. Finalists are then asked to submit a short video explaining why a vehicle would help their organization. The videos will be shown on the 100 Cars for Good Facebook page and public voting will begin on May 14. Voting takes place daily, with 5 of the qualifying organizations being shown each day. The four runners up each day will receive a $1,000 cash grant from Toyota for participating. Toyota models to be given include a Camry Hybrid, Highlander SUV, Prius v, Sienna minivan, Sienna Mobility (the handi-ready version of the Sienna with built-in wheelchair ramp), or a Tundra full-sized pickup. Each vehicle includes a 6-year, 100,000 mile warranty as if it were purchased new from a dealership and will be delivered through a dealer local to the charity.